Drinking alcohol is a social activity. People drink alcohol to celebrate or commiserate events. When consumed in the right amounts, drinking alcohol is a pleasurable experience. Alcohol is absorbed from the stomach into the bloodstream and affects the central nervous system, namely our breathing and heart rate, as well as how we think, feel, perceive things and behave. However, alcohol is high in calories, has no food value; and if not used sensibly, can cause considerable harm to your health and general well-being. What is alcohol and how is it made? The type of alcohol that is in the alcoholic drinks we drink is a chemical called ethanol. Alcohol is made from by grains, fruits or vegetables through a process called fermentation (when yeast or bacteria react with the sugars in food – the by-products are ethanol and carbon dioxide). The alcohol content of a drink is affected by how long it’s left to ferment. Wine and cider are made by fermenting fruit, while beer and spirits are made from fermented cereals such as barley and rye. Spirits also go through a process called distillation during which a proportion of the water is removed, leaving a stronger concentration of alcohol and flavor. 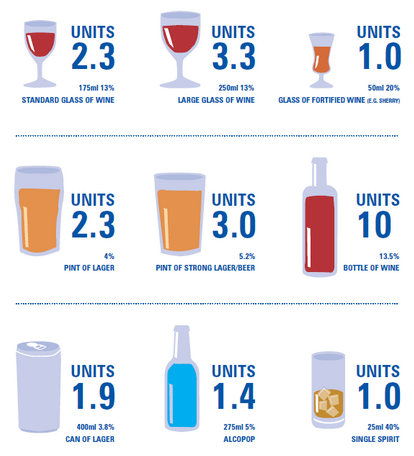 The number of units in a drink is based on the size of the drink as well as its alcohol strength. The standard measure ‘ABV’ – Alcohol By Volume is a measure of the amount of pure alcohol as a percentage of the total volume of liquid in a drink. You can find the ABV on the labels of cans and bottles. For example, wine that says “12% ABV” or “alcohol volume 12%” means that 12% of the volume of that drink is pure alcohol. 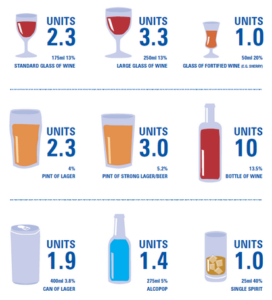 The number of units in any drink can be calculated by multiplying the total volume of a drink (in ml) by its ABV (which is measured as a percentage) and dividing the result by 1,000. Remember, drink measures are not always the same. What you get in a pub and what you pour for yourself could be very different.